Dr. C. Ronald S. Williams II is Founder, Senior Pastor, and Chief Executive Officer of Mount Zion Fellowship in Highland Hills, Ohio. Dr. Williams is the former pastor of St. Paul United Methodist Church in Ashland, Ohio. Under his leadership, St. Paul grew from two to 150 members. The Church built a new sanctuary and education wing in 1980 under his oversight. Dr. Williams was led to return to Cleveland, Ohio in 1982 where he founded Mount Zion Fellowship (formerly Brethren Fellowship of the Savior). The first meeting was held on the fourth Sunday in December, 1982 leading up to the first service in January 1983. There were 15 people in attendance. In 1991, the Church’s name was changed to Mount Zion Fellowship. Current membership is approximately 3000 members. Mount Zion Fellowship was built under the oversight of Dr. Williams. Its mission is to preach, teach and live in a way that encourages the salvation of souls through faith in the Lord, Jesus Christ. This is accomplished through Dr. Williams’ preachings and teachings, as well as through the many ministries of Mount Zion Fellowship. Dr. Williams is an accomplished gospel music composer, arranger, musician and musical director. From 1977 to the present, he has recorded with his own choirs, The Messengers of Peace (1977-1982) and the Voices of Koinonia (1984-present). “My Soul Sings Hallelujah” is a piano concert by Dr. Williams, accompanied by members of the Cleveland Orchestra and the Voices of Koinonia Choir. 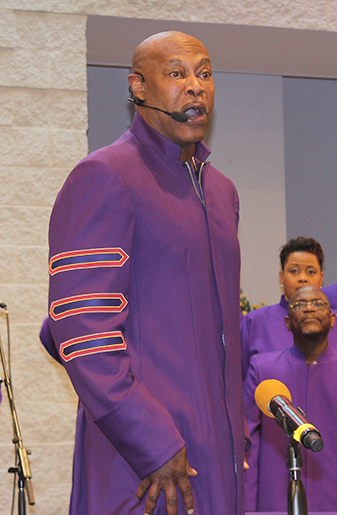 In addition, Dr. Williams has performed in concerts with such gospel artists as Donnie McClurkin and Kirk Franklin. He has performed at Cleveland’s Rock and Roll Hall of Fame, Playhouse Square and has appeared with Barry Manilow at the Blossom Music Center. Dr. Williams has authored five books. Pastor Ron, as he is affectionately known, is a devoted, loving father to his two sons, Clifton and Christian.